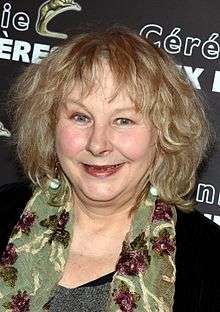 Yolande Moreau (born 27 February 1953) is a Belgian comedian, actress, film director and screenwriter. She has won three César Awards from four nominations. Moreau is prize-winner of three César Awards: one for best first film (in 2005) and two as best actress (in 2005 and 2009). She has more of the awards than any other Belgian actress. She made her debut in cinema with the director Agnès Varda with two movies : Sept pièces (1984) and Vagabond (1985). In 1989 she joined Jérôme Deschamps and Macha Makeieff's troupe, of which she became one of the stars, especially with the TV programme, Les Deschiens. She played La Levaque in Germinal (1993) directed by Claude Berri, a concierge in the film Amélie (2001) and Mama Chow in Micmacs (2009) (both directed by Jean-Pierre Jeunet), a mime in Paris, Je T'aime (2006) and a lovesick woman in Vagabond (1985) directed by Agnes Varda. She make her directional debut with the movie When the Sea Rises, in which she also starred and she is the co-writer. The movie is really loved by the critics and Yolande Moreau won two César Awards for Best Debut and Best Actress. Moreau stars in the French horror thriller film The Pack, which premiered at the 2010 Cannes Film Festival. Her 2013 film Henri was screened in the Directors' Fortnight section at the 2013 Cannes Film Festival. Movies starring Yolande Moreau with more than a million of entries in France. ↑ The Pack Too Crazed for Cannes? ↑ "List of films in Cannes Directors' Fortnight". Cannes. 24 May 2013. Retrieved 24 May 2013. Wikimedia Commons has media related to Yolande Moreau.